The lady at the MAC counter wore orangey-red lipstick, caked on about an inch thick. The rest of her face was clownishly white and matte, and she looked like she had tried using liquid eyeliner for the first time that morning. Her eyelashes were like furry tarantula legs. She wore four-inch heels and you could tell she thought she was all that. This should have been my first clue to keep on walking. But I’ve been thinking my makeup routine needs a kick in the ribs. I turn 40 this year and have been contemplating what I should look like for my mid-life crisis. I didn’t know if MAC did animal testing, but I did know they are more expensive than my usual Body Shop cosmetics. It felt like an exciting and calculated risk to stop and browse. I asked the lady for her assistance and suggestions in how to spruce up my look. I generally wear a shimmery taupe shadow, black or brown eyeliner, mascara, and a pinkish blush. Sometimes I jazz things up with radiant highlighter. She suggested a foundation, a concealer, and a foundation to wear on top of the foundation. While I wasn’t aware I needed quite so much, uh, coverage, I went along for the ride. She applied purple eyeliner and brown shadows. Wait. What? Did she just call me old? I desperately wanted to say something, but my tongue was frozen. I love shimmer. I mean, gone are the days when I plastered my entire body in vanilla-scented glitter to go out for the night, but a girl’s gotta’ have a little glow! As for not looking my age? Well, that pleases me. Lately, I have been shocking people when I mention that I am about to turn the big Four Oh. 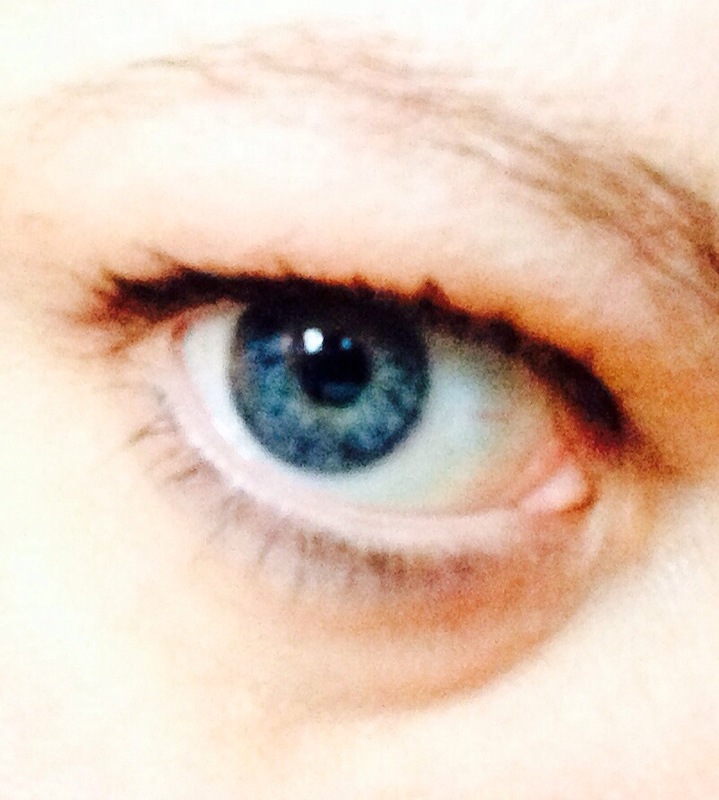 I have decent, dewy skin and mischievous, bright blue eyes. But as I sat sweating in that chair, I felt like an elderly, bitter, wrinkled-up olive. She worked away, building layer upon layer on my skin. Inside, I shook, insulted, and hurt. Incredulously, I let her complete her task, mentally calculating how much it would cost to purchase the twenty products she was glopping onto my flesh, vowing not to spend a cent, wondering if she worked on commission. I examined myself in the hand held mirror, then peeked up at her vapid, 20-something face. “I want to go outside and look at it in the natural light,” I told her. “I’ll be right back.” I’m not sure why I felt the need to lie to her; I clearly had no intention of returning or buying anything from her. Driving home, the tears created rivulets in the make up on my cheeks. Too old for shimmer, I chanted in my head. By the time I walked into the house I was sobbing. I collapsed in my husband’s arms. “The lady at the MAC counter said I was too old for shimmery make up!” I cried. He kissed me. Reassured me. Told me it didn’t matter what anyone else in the world thought. Who made those stupid make up rules anyway? Still crying, like a wounded child, I went into the bathroom and washed my face. As the dark circles and laugh lines emerged from beneath the mask, I felt comforted, but wished I could go back and say something pithy and bright to that salesgirl. I contemplated my nearly, 40-year-old face. Maybe the change would be to wear less make up, I thought, and blew my nose. Who am I fooling? I’ll never give up my shimmer. In fact, I think I will wear more. Those ladies need to learn that they won’t make a sale by insulting their clientele. And poo on what she thinks – I think you should wear what makes you feel great! Shimmer doesn’t have an age! I think you are supposed to glow, no matter how old you are! Yay for the shimmer!!!! Sorry but i really laughed when reading your description of the lady and your excuse “I want to go outside and look at it in the natural light,” I have to learn it and use it! So sad you cried, but sometimes our emotions are triggered by some random things and it could so happen to me too (in fact it happened recently: my feet are now a size 10 after the pregnancy and some salesgirl told me she had to place a special order for “big sizes”). You know what by the way? Your post prompted me to achieve the decision I took some days ago that what to dump all non-shimmery eye make-up because I never use it! I am going to do it right now, out of solidarity. BTW you have the most lovely eyes! Well thank you dear! I accept and appreciate the compliment! xoxo. I was a Mary Kay consultant many moons ago, and I remember the directors teaching us that shimmery makeup highlights wrinkles, so women with wrinkles should wear matte products. I was so sad! I’m in the shimmer camp, like you. I played around with it afterward and saw that, yes, shimmer does makes wrinkles and generally floppy skin look more so. But, ultimately, who cares? Let’s enjoy what we love and be grateful for the wisdom we’re accumulating! Well, I do not have any wrinkles or floppy skin, per se on my eye lids, and always fancied that my make up was flattering. . . sigh. I’m still rocking the shimmer. I think the makeup lady’s perspective has a lot to do with who she’s wearing makeup for- obviously for others and to impress them. I know for me (and I’d assume you too, at least to some extent), when I wear makeup, it’s for me to feel better about myself. I don’t care as much about what others think of me, and whether or not they approve of my eyeshadow, etc. Sure, there’s some element of wanting to feel and seem more pulled together (especially when I FEEL like I’m unraveling at the seams), which has to do with how others perceive me, but a lot of it has to do with how I want to care for myself and show myself a little love.